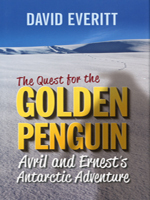 An unexpected and inspiring end-of-term lesson about Antarctica sets Australian twins Avril and Ernest off on a voyage there, looking for a rarely seen penguin that is rumored to lay eggs of solid gold. Their quest for untold riches takes them to the frozen South Pole via South Africa, a Danish icebreaker and a polar weather station. There, they are welcomed by the seasoned crew who are keen to help the youngsters find out as much as possible about this extreme southern part of the world for their school project. But in their over-enthusiasm, the brother and sister nearly meet an icy end that leads them to find something more valuable than they could ever have dreamed of.